Approximately 65 percent of hospitals plan to spend an average of $1.9 million on analytics in 2015, according to a survey conducted by CDW Healthcare. By applying complex algorithms to massive volumes of electronic data, analytics work to lower costs, improve care, predict outcomes, and manage population health. Many experts believe analytics drive the true return on investment of EHR technology. However, 80 percent of the data that resides in EHRs remains in an unstructured narrative format, making it virtually inaccessible for analytics purposes. Furthermore, healthcare data is spread across multiple hospital systems—disjointed and unintegrated. Disparate systems capture the same information, but in different formats, nomenclatures and terminologies. One multi-hospital health system reported 67 different ways to identify patient gender during a recent data clean-up project. Faulty, redundant and unstructured information within hospital systems impede the healthcare industry’s progress toward effective, data-driven decision making. This article explores how natural language processing (NLP) is being used to address one of these data disparity issues: unstructured data. NLP technology taps into the power of unstructured data. NLP is used within and atop existing systems and technology applications to support better data-driven decision making in five key operational areas: ICD-10 coding, speech recognition, core measure reporting, research/clinical trials, and clinical documentation improvement. NLP generates key data points from electronic, text-based documents. Once identified by the NLP rules engine, the data points can be analyzed and manipulated in a variety of ways. NLP allows organizations to perform tasks such as case identification, real-time patient monitoring, and data gathering for national quality reporting. Without NLP, traditional data analytics tools simply wouldn’t work with unstructured data. NLP is also often in the background of more visible technologies that make work easier for physicians, coders, case managers, and many others who rely on clinical data within an organization. For example, computer-assisted coding (CAC) and speech recognition vendors use NLP’s rules and engines as the underpinnings for their applications. Without NLP, these technologies wouldn’t be nearly as effective. Let’s take a closer look at how organizations are using NLP to get at the heart of clinical data in the EHR. Create opportunities for clinical documentation improvement (CDI) efficiencies. NLP helps CDI specialists perform comprehensive data mining in a matter of seconds. Instead of reviewing hundreds of cases, CDI specialists use the NLP-generated work list to focus exclusively on cases with identified documentation gaps and improvement opportunities. The ability to automate case finding will become even more critical as organizations improve the granularity of clinical documentation for accurate coding and billing under ICD-10.This data-driven workflow improves query rates and overall efficiency, and it allows CDI specialists to focus on fixing documentation rather than searching for certain diagnoses. Greater efficiency, in turn, improves financial outcomes through increased review rates. Expedite patient identification for clinical trial enrollment. NLP helps organizations quickly identify patients who may be eligible for immunotherapies, clinical trials and medical research. Automated case finding ensures patients are informed about all possible care options early in the disease process versus post discharge thereby making clinical trials more efficient and effective. Comply with core measures. Using NLP, organizations assess documentation immediately upon admission so close monitoring can occur. Quality reviewers spend more time reviewing cases instead of sifting through charts. NLP also allows for faster review of progress notes and problem lists, helping quality reviewers identify patients as soon as they fail criteria in the ED so prompt action can be taken. Provide real-time data about patients. Hospitals use NLP concurrently to monitor patients while they are in the hospital receiving treatment. For example, as physicians document certain diagnoses or procedures (e.g., insertion of urinary catheter), NLP generates alerts and reminders so providers monitor these patients frequently to mitigate the risk of urinary tract infection—one of many hospital-acquired conditions identified by CMS.Another example is using NLP to track sepsis patients. NLP helps uncover the symptoms immediately rather than retrospectively. Physicians can then direct their attention toward these patients and reduce the likelihood that they will be readmitted. Vendors (i.e., overlaying applications) are also using NLP in a variety of ways. Consider the three most common applications of NLP in healthcare: coding, EHRs and speech recognition/dictation. When embedded directly within the EHR, NLP automatically converts a physician’s free-text comments as well as digital narrative text-based content into discrete data. Some vendors combine speech recognition technology with NLP to prompt physicians to elaborate on or clarify certain documentation elements as they dictate – known as Computer-Aided Physician Documentation (CAPD). Unlike speech recognition, which simply converts spoken word into digital text, NLP infers meaning behind the words. Physicians continue to dictate and/or speak their reports while NLP engines convert this information into work lists for CDI professionals, discrete data for the EHR, or quality measure compliance reports. NLP will continue to play an important role in data analytics and population health management. As more organizations implement EHRs, NLP will be the foundation for abstracting valuable narrative information and turning it into actionable data that can make a big difference in terms of healthcare outcomes and efficiency. Faulty and redundant data issues will remain a problem in healthcare and must be addressed through stronger information governance programs. In the interim, organizations and technology vendors should use NLP to eliminate one major electronic information hurdle—unstructured data. Steve is responsible for business development and product strategy at RecordsOne. Since joining in 2007, he has guided the company from a dictation and transcription technology vendor to a complete clinical documentation solutions provider. He has worked with multiple hospital and clinic organizations to assess, improve and automate revenue cycle processes and workflows through technology. Steve is a national author and speaker on the use of natural language processing technology in healthcare. He works hand in hand with hospitals to identify new and innovative uses for NLP within coding, clinical documentation improvement, quality reporting and reimbursement. Steve is an active member of AHIMA, ACDIS, HIMSS and WEDI with most recent speaking sessions at AHIMA’s National Data and CDI Summits in late 2015 as well as the AHIMA national convention. NueMD recently released findings from their April 2015 survey exploring small and mid-sized medical practices’ attitudes towards the pending transition to ICD-10, a more granular disease and diagnosis classification system. With the October implementation deadline fast approaching, NueMD surveyed 1,000 medical practice professionals and billers about their stress levels, areas of concern, the general sense of preparedness regarding switching to the new coding standards. When asked how confident they are that their employees will be trained by the ICD-10 deadline, only 11.4% of survey respondents indicated feeling “highly confident,” with the most common response being “Not at all confident” (35%). View NueMD’s ICD-10 survey findings report to learn more about survey participants’ attitudes, concerns, expectations and preparedness related to ICD-10 adoption. NueMD is the leading provider of cloud-based medical practice management software for small practices. Powered by Nuesoft Technologies, Inc., NueMD offers practice management, electronic health record and medical billing software and services to help physicians maintain the clinical and financial well-being of their practice. For more information please visit www.nuemd.com. The Institute for Healthcare Information Technology (IHIT) commissioned Porter Research to perform a follow-up project stemming from last year’s “Georgia Healthcare IT Workforce Readiness Survey”, which involved a statewide survey of healthcare IT service providers (vendors) and practitioners (hospitals, clinicians) to gauge the status of their plans to expand and hire from within the state, as well as their perceptions of how well-equipped Georgia’s educational institutions are to provide qualified healthcare IT job candidates. The Workforce Readiness project produced a whitepaper, highlighting the research findings, that IHIT shared with state leaders and educational representatives. It was decided that follow-up research was needed to collect more granular insight about specific areas of industry perceptions as it relates to the state’s educational system. Consequently, IHIT in collaboration with the Technical College System of Georgia, the University System of Georgia, and Emory Continuing Education conducted a series of interviews and discussions with top executives from a random selection of 10 healthcare IT companies, of varying sizes, located in the Metro Atlanta area. Unlike the earlier, larger-scope statewide research project, this follow-up effort was designed as a face-to-face meeting with industry leaders in order to get feedback beyond a Q&A session. The in-person format allowed for every company to be presented with the same set of open-ended discussion topics in the hopes of starting a dialogue between all parties. 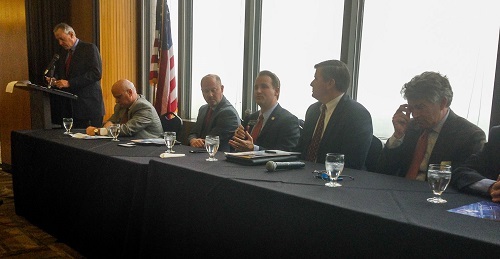 The meetings were also held to help evaluate current educational offerings as well as proposed future initiatives that could be developed to “bridge any gaps” that may exist between the job demand and the educational supply to foster growth for Georgia’s healthcare IT industry. The newly-released “Georgia Healthcare IT & Education Working Together” whitepaper covers the interviews with healthcare IT executives, their suggestions for developing an educational “orientation” curriculum to better prepare students, and the responses from healthcare IT educators. The Working Together whitepaper, along with the earlier Workforce Readiness whitepaper, can be downloaded here. IHIT is an Atlanta-based non-profit organization founded for the purpose of connecting resources and leveraging strengths of the healthcare IT industry within Georgia and the Southeastern U.S. to expand technology throughout the nation’s healthcare system. Cynthia Porter (President, Porter Research) and Susan Irby (Business Intelligence Practice Leader, Maestro Strategies), who collectively boast more than fifty years of experience serving and consulting in the healthcare industry, addressed the ways healthcare vendors and suppliers are redefining their ROI positioning to better demonstrate the far-reaching value of increasingly complex healthcare solutions to potential provider and payer buyers. Guest speaker and HealthEdge Vice President of Marketing Brian Bogie shared details on his experience working with Porter and Maestro to quantify the value of HealthEdge solution components that may have a huge impact on healthcare organizations without the benefit of being quantified financially, and to validate those perceived benefits through objective client research. Hear more about Brian’s success developing an ROI took kit to help his company articulate full solution value and build trust with healthcare buyers by accessing the webinar event recording here. Slides from the presentation are also included below. If you would like to learn more about developing an ROI tool kit for your company, conducting benefit validation research with your clients, or procuring health market data to help facilitate engagement, contact Porter Research. 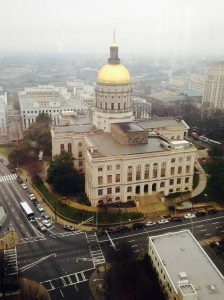 Georgia Lieutenant Governor Casey Cagle proclaimed February 24th as “Georgia HIT Day” at a state capitol gathering held earlier this week where local officials and healthcare technology firms convened to discuss the economic impact healthcare IT is having in the region. Tag Health, in partnership with Georgia HIMSS and the Metro Atlanta Chamber, hosted speakers from local HIT companies McKesson Technology Solutions, HealthPort Technologies, and Navicure, Inc. for a panel discussion primarily focused on job opportunity the HIT market has brought to Georgia. Recent HIT market research from the Institute for Healthcare Information Technology (IHIT) suggests that more than 4,700 healthcare IT jobs are available in the state of Georgia, but research participants report difficulties filling positions. Georgia HIT Day panelists pointed to a need for more individuals with cross-industry experience (i.e. provider, health plan, pharmacy, technology) to help build a qualified HIT workforce. A noticeable portion of event attendees appeared to be professional students in local HIT continuing education programs interested in filling that workforce deficit, and actively seeking employment. State officials and organizational representatives addressed the need to better brand the city’s strengths in healthcare IT (including an educated workforce) to attract more venture funding to the Atlanta market. The city was presented with the HIStalk.com Reader’s Choice Award for recently being voted the “Nation’s Capital of Health IT” at Tuesday’s event. Local healthcare providers and HIT end-users were also in attendance and some aired concerns regarding HIT’s impact on provider productivity. Other provider attendees championed patient safety as HIT’s primary objective, while others voiced the need to bring a wider variety of HIT end-users (i.e. nurses) to the product development table. To date, roughly two-thirds of Georgia hospitals have received funds for successfully demonstrating meaningful use of an Electronic Health Record (EHR) system as part of CMS’s Medicare EHR Incentive Program. You can read more about Georgia healthcare benchmarks here. Navicure, a provider of cloud-based healthcare billing and payment solutions, today announced key findings from its third ICD-10 readiness survey, deployed in January 2015 in conjunction with Porter Research. The findings revealed physician practices are generally optimistic about being ready for the October 1, 2015, transition date, although only 21 percent feel they are currently on track with preparation efforts. As with Navicure’s first two surveys, the majority of participants (57 percent) were practice administrators or billing managers from practices with one to 10 providers. The next largest group was billers and coders who made up 14 percent, followed by practice executives (13 percent). Physician practices don’t think ICD-10 will be delayed again. 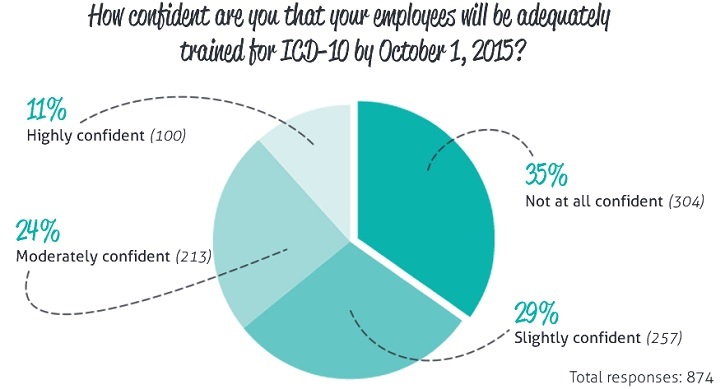 The majority of respondents (67 percent) believe the ICD-10 transition will take place on the October 1, 2015, implementation deadline. Potential impact on revenue and cash flow is the greatest concern. Fifty-nine percent of respondents noted cash flow was a concern, while 12 percent indicated their greatest concern is staff productivity, followed by 11 percent who are most concerned the transition will be delayed again. Respondents feel the biggest challenge will be dealing with unprepared payers. Forty-one percent of respondents cite lack of payer readiness as the most challenging aspect of the transition. End-to-end testing with payers remains a priority for practices, though the percent of those opting out of testing opportunities is increasing. This survey was a follow up to surveys conducted in April and November 2013. Navicure will sponsor additional surveys in 2015 to continue monitoring changes in attitudes and transition activities as the implementation deadline draws near. To view the complete, current survey results and analysis, visit www.navicure.com/surveythree. Navicure’s cloud-based healthcare billing and payment solutions help healthcare organizations of all sizes increase revenue, accelerate cash flow, and reduce the cost of managing insurance claims and patient payments. Serving more than 50,000 healthcare providers nationwide, Navicure’s technology solutions automate account receivables processes, including claims management; patient eligibility verification; remittance and denial management, including automated secondary claims filing, appeals, and posting; reporting and analysis; and patient payment collections at and near the time of service. Navicure’s solutions are supported by its unique 3-Ring® Client Service which guarantees that a client service representative will answer every client call in three rings or less, even during times of transition such as 5010 and ICD-10. Navicure is the exclusive billing and payment solution of the MGMA AdminiServe® Partner Network and an MGMA Executive Partner. In the past seven years, Navicure has been included among the top three clearinghouses in a field of more than a dozen solutions ranked by KLAS® (www.klasresearch.com), winning “Best in KLAS” distinctions in 2008, 2010 and 2012. Navicure also received the 2013 Gold Stevie Award for Healthcare Customer Service Team of the Year as part of the 2013 Stevie Awards for Sales and Customer Service. Navicure continues to be ranked among the fastest growing companies nationally in the Inc. 5000 and Deloitte Fast 500 rankings. For more information, please visit www.navicure.com. Porter Research – a Billian Inc. company – has for over 20 years worked diligently to understand and assess each client’s unique needs and to build a customized business-to business research program to achieve desired goals. The company has worked with over 300 healthcare IT companies, providing many with Goto-Market Strategies based on its unparalleled experience, proven methodologies and knowledge-based analysis. Porter Research enables its clients to operate in a fast-changing market of new, emerging technologies and health reform issues such as ICD-10. It provides the unbiased results that healthcare clients need to make informed, strategic business decisions. For more information, visit www.PorterResearch.com, follow @PorterResearch on Twitter, or call 678-282-1033. There has been no short supply of companies who serve multiple markets focusing their attention on the healthcare portion of their business portfolio in recent years. 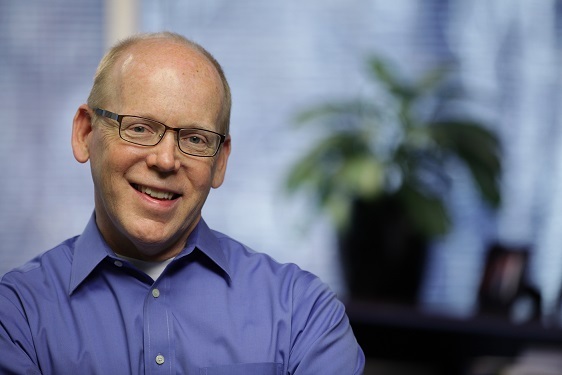 Porter Research recently spoke with Brad Dodge, founder and CEO of Dodge Communications, about why companies with multiple verticals need an agency that specializes in healthcare to help them reach the traditionally closed-circuit market. Dodge, who has helped more than 200 organizations sell products and services to the healthcare industry, offered us a glimpse into his experience helping these companies gain better traction in the more complex market of healthcare. Many companies are already using a PR or marketing partner to assist with their communications needs. What value have clients you’ve worked with seen in selecting a firm that specializes in only healthcare? Dodge: It’s interesting because the healthcare industry is so unlike other vertical markets. We find that companies often don’t realize how unique an industry healthcare really is. When we’ve worked with firms like Experian or Comdata or Ricoh that have multiple verticals, they really find a lot of value in the expertise that we bring to their healthcare vertical because there are different pain points, different buying behavior, and different decision makers, and our expertise helps them make inroads to the market quickly. Healthcare IT is at the forefront of national discussions. How can companies that might not be known for their healthcare offerings shift the conversation in their direction and make sure they’re developing brand recognition and a solid reputation in the space? Many companies realize the importance of having a healthcare focus. They already have an established business that’s successful in other verticals and they conclude that a healthcare focus is key to their growth. They don’t always recognize how hard it’s going to be to do that. NCR is a good example—they acquired their way into the B2B healthcare space when we were working with them several years ago. It was an eye opener for them to see the differences between healthcare and retail and they had trouble quickly establishing significant brand awareness or thought leadership in healthcare. That’s where we were really able to add some value to what they were trying to do because we understood how to construct and approach healthcare segments and position their messages accordingly. We were really able to infuse a lot of value into their healthcare presence right from the word ‘go,’ more so than a generalized multi-vertical type of agency, or their parent agency would have been able to do from the start. What strategies can a company use to expand the market’s perception of them and showcase their offerings in other divisions? I think that it all has to do with messaging, really. The focus today is really on personalizing the message to a unique, individual buyer. It’s similar to the way Amazon or your other favorite retailers operate—they want to customize messages specifically to you. As these companies are able to segment down their market, they need to realize that the motivations and issues that a nurse informatics officer is dealing with are very different and distinct from what a CIO is dealing with. From a messaging perspective, they have to articulate those messages clearly so that you can resonate your message with the particular segment. The further ratcheted down you can do that—the closer to “one” that you can get for your targeted message—the better value you’re going to have with the efforts you’re putting forth in PR and marketing. How can you simplify the complex messages that are so often present in healthcare IT and help companies clarify what they are trying to say? These complex messages are complex for a reason, because it’s really tough stuff that these healthcare companies are doing and they’re really complex solutions that they’re bringing to the table. There’s really not a one-size-fits all kind of answer to this question. Companies need to have a number of different communication vehicles, from the heavy duty stuff like a whitepaper or ebook – even their Web content might be heavy, whereas they also need to have simple things like video testimonials, solution overviews, infographics and other visualizations that make it easy for someone to understand. It’s not that a person can’t understand what they’re talking about, but they often can’t understand it quickly because it’s such a complex message. Once you go into it understanding that, you realize that you need different levels of communication in order for people to understand the concept and then go as deep as they need to understand the deep intricacies of the solution that they’re bringing to the table. NueMD, in partnership with Porter Research and The Daniel Brown Law Group, announced the results of its recent survey on HIPAA compliance within small medical practices and billing companies, gauging respondents’ knowledge of HIPAA’s Privacy and Security regulations, compliance measures and communication methods. with compliance compared to medical practices. With a new round of HIPAA audits looming for both Covered Entities and their Business Associates, NueMD hopes survey findings will help medical practices and billing companies better prepare. “Understanding HIPAA can be difficult for practices and billing companies, especially if they’re already scrambling to keep up with changes like ICD-10 and Meaningful Use,” said Caleb Clarke, Sales and Marketing Director at NueMD. “With audits looming, we wanted to get a sense of where the industry stands and provide resources to help those who may be struggling. Survey analysis identified the biggest areas of risk and potential improvement, and offers tips for achieving compliance. NueMD has published the results in an easy-to-consume narrative that explains aspects of HIPAA compliance, presents the data and offers resources for practices and billing companies who want to learn more. To view the results, please visit http://www.nuemd.com/hipaa/survey. The attorneys at The Daniel Brown Law Group specialize in transactional and regulatory healthcare law offering expertise in Stark, Anti-Kickback, HIPAA, Medicare Audits and Appeals and a variety of other compliance issues. They also advise clients on how to structure new healthcare service lines and mergers, as well as consolidations and joint ventures.